Ryuutama is finally ready for the town market! Ryuutama is a tabletop pen-and-paper role-playing game, developed in Japan by designer Atsuhiro Okada. It is set in a world where the "NPCs" of the village--the bakers, minstrels, farmers, shopkeepers and healers--set off on a wonderful adventure exploring a fantasy world together. Some people colloquially call it "Hayao Miyazaki's Oregon Trail", because of its heartwarming (in Japanese "honobono") feel of family anime, and its focus on traveling and wonder over combat and treasure. The game has been out in Japan for years, and is widely loved by the people who play it. Even today long campaigns and short stories are being played in homes and cafes around the country. The Original Ryuutama Japanese Book Cover. Click for a larger view! Please see the website for more in-depth information about Ryuutama. Ryuutama means "Dragon's Egg". It is set in a western fantasy world where the four Seasonal Dragons create and maintain reality. The characters go on an adventure, which is watched from afar by a Ryuujin, or "Dragon-Person". This Ryuujin watches their struggles, and records the events of the characters' journey. The Ryuujin then tells those tales to the Season Dragons, which gives them strength, and helps them bear the eggs of future dragons which will protect the world. The background is that every person in the setting, at some point in their lives, feels an intense need to go on a long journey. Their family, friends, and co-workers understand, and help them prepare for their journey. The characters are not powerful warriors and wizards, but rather just normal village people. The character classes are Minstrel, Merchant, Healer, Hunter, Artisan, Farmer and Noble. Each class has a few simple abilities that reflect their backgrounds. Each character can be a fighting, technical, or magic-using character depending on the player's choice. The players play the roles of the characters, and one Game Master (GM) creates and navigates the characters through a scenario. Together, they create the details of the World and the Towns that the characters visit. The GM also has a special character with its own sheet called the "Ryuujin", which is a character that remains offscreen most of the time, but watches over the characters: The Ryuujin can cast some limited spells or abilities to help out or guide the characters. The GM creates the adversity that the players have to overcome, but the Ryuujin is out to protect and nurture the characters to some degree. Travel and people form the core of the game: While there is a unique console RPG-style combat system that's quite exciting, a majority of the focus of the game is on travel and problem-solving. Hit Point loss and gain mostly happens due to travel, and the unique Seasonal Magical Spells focus on solving interesting problems in unique ways. You just need paper, pencils, a set of polyhedral dice (4, 6, 8, and 10-sided dice), a place to play, and friends with an open heart to play Ryuutama. Record your journeys. Create a tale that you will remember for years to come. Enjoy the time spent with your friends and family. This is what Ryuutama is all about. You can find more about the game, including pictures, at the Ryuutama website. If you're familiar with Tabletop RPGs and want to know how Ryuutama is different, we have a page for that, too. You can peruse some sample English character sheets and the like as well. Finally, you can legally download the full original Japanese version of the game from the 100% legit (the author listed it) free Japanese manga download site "j-comi" (click on the green "PDF" button on the left). The English version will look very similar to that book, but with some extra text and pictures (and of course Be In English!). One day, in a few years, we too hope to make the game available free to all in English as well. The PDF Rulebook - This is a copy of the Ryuutama book in English, running at about 7x10 inches (almost B5 size), 200+ pages, and unlike the original, the English edition will be in full color! It will be gorgeously laid out by layout genius Daniel Solis, using the original Japanese book as inspiration. It will be in PDF format, and distributed exclusively to all backers through DriveThruRPG. Everyone at the PDF backer level and above will have their name added into the book as a supporter. When we finish the first editing pass, everyone at this level will get access to the raw "pre-layout" text as well, so folks can begin playing before the end of the year holidays. We will also bundle some extras with this as well: New rules, new content, and play aids for the table like Terrain and Weather tracking cards. So it's going to be more than "just a book"! Electronic Supplemental Material - Matt and Andy are working on translating a bunch of other supplemental material that came out for the original Japanese and translated French editions of the game. We are also having the author write some more material for the game! This includes new character classes, a travelogue of new places and events, and more. We will also eventually be releasing the supplemental Seafaring rules and Navigator character class. It will be released piecemeal in electronic format. You really only need the core rulebook PDF to enjoy the game, This package just gives you a little more for the future! The Physical Book - We're producing a hardcover copy of Ryuutama. It will be black and white, 7 x 10 inches (intl B5 size), all full-color pages, 200+ total pages, all of the contents of the original Japanese book plus some extra materials, information, notes and clarification. Original Character Art - Miss Toyuki Mizusaka, one of the two original artists of the Ryuutama game (she did most of the art for the supplements), has volunteered her time and energy to do your Ryuutama character sketches! They will be black and white (you can add $40 for full color if you wish), and be delivered electronically in high quality formats. There's only so much art Mizusaka-sensei can produce, so these are in limited quantities. We will send out a survey where you tell us some things about your character, and she will design a manga-style sketch fitting a Ryuutama game. See the sample sketch of "Ruru", below: This is the kind of sketch she will be doing for you. Original Scene Art - Again, Toyuki Mizusaka has volunteered her time and energy to do a limited number of scene sketches for you or your group. The "Ryuutama Marketplace" illustration at the top of this Kickstarter campaign was one such picture. They will be black and white (you can add $40 for full color if you wish), and be delivered electronically in high quality formats. These, too, are in limited quantities. We will send out a survey where you describe the scene and the characters in it, and she will design your scene for you. Some of these sketches may appear in the rulebook! Scenario Design - Atsuhiro Okada has volunteered to craft original Ryuutama scenarios for you and your group! After the Kickstarter ends, you'll give us some details about what you want to see: He will write the scenario (a few pages), we will translate it from Japanese to English, and we'll also have Mizusaka-sensei contribute two pictures of scenes from the scenario (including of your characters, if you wish) to go with it. * An extra physical copy of the book: $40, no additional shipping cost anywhere! If you live outside of the US, please feel free to gather friends and get books together to save money on shipping! Each additional copy you purchase for a friend, we will send one additional electronic PDF to that person, plus add their name as a Backer in the book! If two or more people each want a "PLUS PLUS" level, simply add an additional $10 per person who wants the "PLUS PLUS" rewards! Ruru the Healer, the first Ryuutama character Toyuki Mizusaka played! * We want to develop an English PDF version of Ryuutama that will last forever. * We want to produce 1,000 physical copies of Ryuutama in English, and put them into distribution around the world. * We want to translate and publish some of the supplemental material for the game, if interest warrants it: More text, limited art, and table aids like cards and printouts that help ease into play faster or make it more fun. * We want to do all the above at an easy pace for all of us: No races here: We're in this project for the long haul, and plan to develop for it for years to come. * Finally, we want to get more people interested in Ryuutama: It's a wonderful tabletop RPG that deserves attention. We're opening the system, allowing fans to write, produce, distribute and sell their own material for this game. Atsuhiro Okada 's motto is "No Gaming, No Life": He lives in Tokyo and works at the first tabletop gaming cafe ever created in Japan, Tabletop Cafe Daydream in Kanda ward. His job is to run and play games almost every day of the year, and focuses on getting new men and women interested in tabletop gaming. 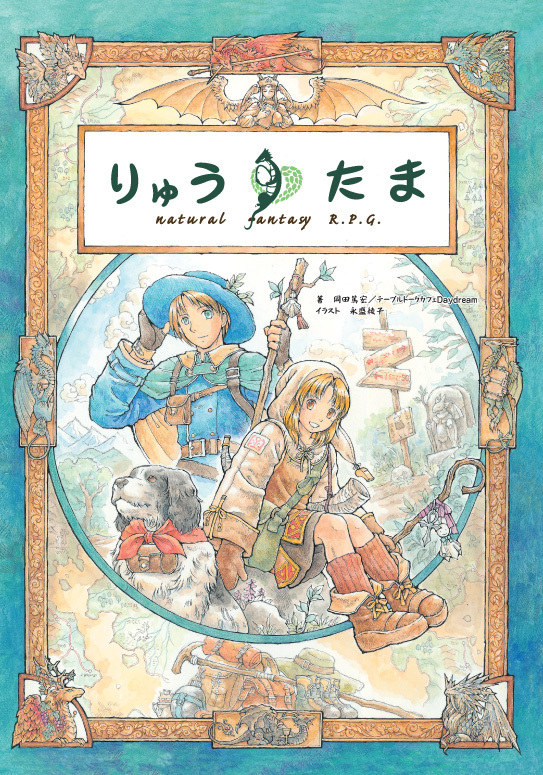 Yuki Mizusaka is one of the two original artists of the game, having worked primarily on the art for the original Ryuutama supplements. She's a wonderful person and an avid gamer (player and GM). Matt Sanchez is the primary translator of the game. His Japanese-fu is epic and love for gaming strong, almost as strong as his love of the "Jojo's Bizarre Adventure" manga series. He lives and works near Atlanta, GA.
Andy Kitkowski is the other translator, and the producer of the game. This is the third Japanese translation/publishing project he's worked on, after Tenra Bansho Zero and Maid: The Role-Playing Game. He lives and works near Durham, NC. Daniel Solis is a layout expert and professional tabletop game designer, and he will be doing the layout of the game. He lives and works near Durham, NC. We're doing something new, called "Milestones". Instead of drumming up higher levels of money to aim for, we're instead taking our time (so that things don't get out of hand) and announcing goals achieved afterwards. Here's the current list of all Milestone Rewards, together. If the item says "++" after, that means it is available to the backers of the "PLUS PLUS" levels. See MILESTONE ONE and MILESTONE TWO updates for details on the below. * We are funding the creation of a Ryuutama gaming/assistant app, for Apple IOS and Android. It will come out within the next year and be reasonably priced. * Ryuutama will be in FULL COLOR for all Kickstarter backers: PDF and Physical Book! * We will be making a free downloadable guide to beginner character creation. Canadian/Japanese Friends: Shipping to Canada, Japan is $28: See the $68, $78 levels. This is a careful estimate at a 3 lb weight for a 220-page, hardcover book at 7x10 inches plus packaging. However, this puts the book right on the line of 3 to 4 lbs. If it crosses over to 4lbs (because of page count, add-ons) or prices go up on intl shipping again, I may later require an additional $8 USD ($36 total) for shipping at a later date. I'm taking a risk by setting Canadian and Japanese shipping at a lower price, so please bear with us. The Character Sketch, Scene Sketch and Adventure Creation levels have to be set to $40 for now for all intl backers. International Friends: Shipping is $40. This, too, is at current cost estimates and rates, and seeing that there are no international rate hikes coming in the next 6 months. However, if prices do go up on intl shipping again unexpectedly, I may later require an additional $10 USD. However, this is not very likely. This cost is a one-time cost: If you order 1, 2, or 4 books at $40 each, the $40 shipping fee is a one-time fee applied to the entire total. Since international shipping rates skyrocketed in January 2013, it's been hard to easily accommodate our international supporters with reasonable shipping rates for the physical book. We are putting a flat $40 fee on all outside-US shipping (except Canada), even though we know that shipping to Canada and Japan is estimated to be $28; Europe $45-55, and Asia $45-60. We're willing to take a small hit on the books in order to get them to you. Extra donations are always welcome! In any case, shipping within the US will be free. I would highly recommend international backers to look into reshipper/reshipping services (also called "mail forwarders" who will work with your country to bring you goods from the US. In most cases you'll receive a US address for us to ship to, and you will pay them about $25-35 (and no cost of shipping from us to the forwarding address) rather than $40; furthermore, the book will get there just as fast as if we had sent it direct. Also, if it's easier, you can always just back the electronic copy of the book: We'll of course grant you full rights to print the book yourself or with a local Print on Demand service; we will also allow everyone to print their copies from DriveThruRPG: For international physical backers, printing a softcover copy locally and having it shipped that way will save you some money. * Get your friends to buy their copies together: Each additional copy of the book is $40 per book, with no extra shipping costs: Just the one-time $40 shipping fee. You will also get one "PDF Download Link" per extra book copy you buy, so your friends will be able to get a download of the game as well. * Look into a reshipper/mail forwarder that services your country. Using the dimensions above, you may be able to turn a $40 shipping (from USPS) into a $25 or less deal. * Stick to the PDF version for now. You can then print that version locally at a Print on Demand or other printer if you want. Thank you so much for your understanding, this really hurt us but we don't want to cause problems in production because of lack of funds. The game is done, we just need to tighten and edit. So there is no development time needed, and we'll be avoiding all those potholes. All backers will get access to the "plaintext only" copy shortly after the Kickstarter project finishes (or before, if we can complete the first editing pass by then). We support all types of gaming and playstyles: Atsuhiro-sensei plays everything from Warhammer minis (he will roll over you with his Skaven army) to Honobono-themed family games. We all love Ryuutama, and none of us consider it the Final Word of tabletop roleplaying; it's just another great, fun, well-designed game to put in your toolchest and play with your friends. Finally, I want to give a big shout out to Andi from Germany of the band Gillicuddy: You can visit his Bandcamp page here. His album "...Plays Guitar" is a perfect accompaniment to a Ryuutama game table. When I first heard the tune "Travelling Made-up Continents" (the one we used in our video, after asking Andi for permission), I knew that this was the perfect track to accompany this project. The entire album is wonderful: If you're a fan of fingerstyle classical guitar (Will Ackerman etc) it's definitely worth a listen/purchase. Please check it out! * Overall product delay - Not likely. The game is translated from front to back, with the current exception of a few hand-written captions. We just have to edit it, and add two pages of explanatory text. We're not starting the project; rather we're a few meters from the finishing line. * PDF delay - The layout person, Daniel Solis, is noteworthy for his professionalism and speed. No issue here. * Book delay - Instead of overseas, we are printing in the US this time with a reputable printer. No unexpected cultural or freight delays. The distributor/warehouse is two states away, and are as well very reputable (we've worked with them for years), so no major problems/"several months delay" expected there. * Overall burnout/Fatigue - We're keeping this Kickstarter simple. We have more in the pipes for it, stuff that will be available to you all, but that will come in time. But me and Matt have day jobs, and want to make sure that we're not going to promise more than we can deliver, and burn ourselves out. Plus, we well-padded our expected deadlines so that we don't blow through them. Our Thanks! At this level, you get to support this translation effort and get updates on all our secret stuff! Same as above, but you will get some iPhone/iPad/PC scale desktop backgrounds. ELECTRONIC RYUUTAMA - You will get the core English Ryuutama rulebook in PDF format. Also, your name will be included in the book as a supporter of the project. Finally, you will receive an early draft version of the game shortly after the Kickstarter ends. ELECTRONIC RYUUTAMA PLUS PLUS - As the above, but you will also have full access to all of the extra electronic supplemental material we produce for the game, forever: Sourcebooks, travelogues, play aids, and so forth. PHYSICAL RYUUTAMA - You will get the Ryuutama rulebook in hardcopy and PDF. Also, your name will be included in the book as a supporter of the project. PHYSICAL RYUUTAMA PLUS PLUS - Same as the above, but you will also have full access to all of the extra electronic supplemental material we produce for the game, forever: Sourcebooks, travelogues, play aids, and so forth. CHARACTER ILLUSTRATION! - Same as PHYSICAL RYUUTAMA PLUS PLUS level, but you also get a character sketch of your own Ryuutama character by the original artist Toyuki Mizusaka. B&W, HQ, digital delivery. Add $40 for Full Color. FRIEND OF THE RETAILER LEVEL. If you own/run a brick and mortar store for gaming, anime, Japanese books, etc, you can back us at this level: 6 Copies of Ryuutama for you, free shipping, before they go to distro channels. International: Add $50. For Brick and Mortar (physical) retailer stores only. MORE CHARACTER ILLUSTRATION! - Exactly the same as CHARACTER ILLUSTRATION!, just 10 more slots at a higher price tier. THE LAST CHARACTER ILLUSTRATION SET! - Exactly the same as CHARACTER ILLUSTRATION!, just offering the Final 10 Slots at a higher price tier. After this, there are no more character art slots offered! RYUUTAMA LIFE! Same as PHYSICAL RYUUTAMA PLUS PLUS level, but you also get to describe a scene for Ryuutama (a scene, multiple characters) and original artist Toyuki Mizusaka will sketch it for you. B&W, HQ, digital delivery. Add $40 for Full Color. THE FINAL FIVE RYUUTAMA LIFE! - Exactly the same as RYUUTAMA LIFE! tier, just offering the Final Five Slots at a higher price. After this, there are no more art slots offered! Same as PHYSICAL RYUUTAMA PLUS PLUS, but you get two copies of the game: Then, original Ryuutama designer Atsuhiro Okada will design an original scenario tailored to your group, and we will translate it. Then Toyuki Mizusaka will add two illustrations to accompany your scenario. You will also get early access to any future games we translate.